…but Vicki Culpin is far from it. 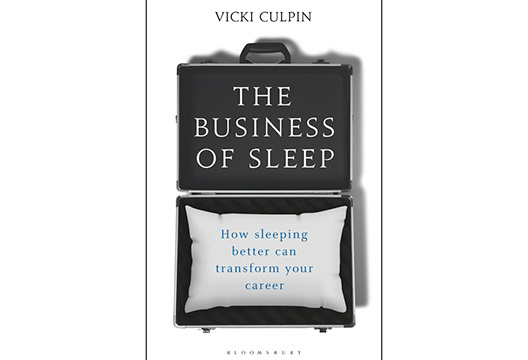 We spoke to her about her recently published book, The Business of Sleep (Bloomsbury). How did you get into studying sleep? Like most psychologists, I suspect I’ve ended up where I am slightly accidentally. I did my PhD in short-term memory and was working in academia when I was approached by someone working in a sleep lab in a hospital looking at sleep apnoea. One of the symptoms of sleep apnoea is poor memory. I started to work with her from the memory angle, to devise tests, and as I did this I started to think this sleep stuff is really quite cool – forget the memory stuff, this sleep stuff is really quite interesting. At the same time, I was teaching forensic psychology in the university and a colleague suggested we looked at this in a forensic environment – the environment within the various secure units that people are in is often not conducive to good sleep. And you have a group of people who are very vulnerable, and often quite aggressive and hostile; and these are things that we also know change with poor sleep. So, the first piece of academic research was looking at the quality and quantity of sleep and how it related to hostility and anger and aggression. Then I moved into a business environment about 11 years ago and I thought, there’s really something here around this. If sleep affects mood in the way that we’ve found that it does, then this must have implications for business. Why are we waking up to the importance of sleep now? There’s a perfect storm. Firstly, the huge advent of accessible technology. This has made it easier to get better data about sleep for research, and also for individuals to have easy access to their personal sleep data. Secondly, the increased focus on wellbeing – organisations are focused on how they can attract, retain and engage talent, and a focus on wellbeing has recently really become part of that. So, they are starting to think more creatively about what support they can give employees and sleep is creeping up the agenda. Thirdly, the advent of cheaper MRI scanning that comes into research. Sleep researchers are doing amazing stuff about really seeing the effect on the brain of poor sleep, when you’re making decisions in a scanner and you can see what’s happening in the brain. Fourthly, there are some really good sleep researchers who have managed to bridge the divide between the research and the lay person. Have you changed your behaviour around sleep since researching the area? Yes – I’ve got much more aware of how important it is and the impact that it has for me – physically and cognitively. I know that I need to look after myself, and I’m lucky as I notice very quickly when I haven’t had enough sleep – I tend to get a really bad headache. This is a real benefit, as if you notice the impact then it’s a lot easier to prioritise sleep. I also take it seriously because I don’t want to be hypocritical. If I stand in front of people extolling the virtues of sleep, and I know I’ve only had four hours the night before, it doesn’t feel good. So, sleep feels like an individual issue, why should organisations get involved and what should they do? I draw the analogy to drinking. If someone turns up drunk for work you’d have a conversation with them about it – even though they might be drinking in their own time. The impact of poor sleep can show up at work, can really affect someone’s behaviour, and therefore organisations have a responsibility – and should have an interest – in how to support them. I think there needs to be some really strong evidence and really good practice within organisations to make it demonstrable. At the moment there are a lot of organisations doing good stuff but there are no consistent metrics to show that it works – there is a timing issue – the time is coming. We need to link changes in policy to bottom line results. We need research to show what works and why and then we can have very clear guidance. How else can we help people to change their sleep behaviour? On an individual level, its firstly about working out the focus – is it about quantity of sleep or the quality. Then I’d suggest looking at seven or eight things that could be affecting their sleep (e.g. technology, mealtimes, caffeine). Address one at a time for a couple of weeks and notice whether they feel better or worse. There will often be multiple causes, and my advice would be to find the smallest change that will make the biggest difference.